Yesterday we made a new fire break for use in our savanna burns. This break will also provide improved access for management purposes. Incidentally, it will also provide a new walking trail through a nice savanna area. The location of the new fire break is shown in purple on the map. 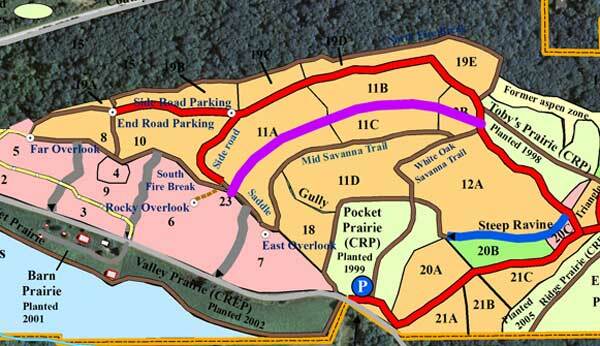 This divides the rather large Unit 11 and should make it easier to burn this important savanna area. The part of this unit labeled 11A is very open savanna with conservative remnant species (lead plant, New Jersey tea, prairie grasses) whereas the part labeled 11B is more wooded, with open-grown bur and white oaks as well as shagbark hickories. 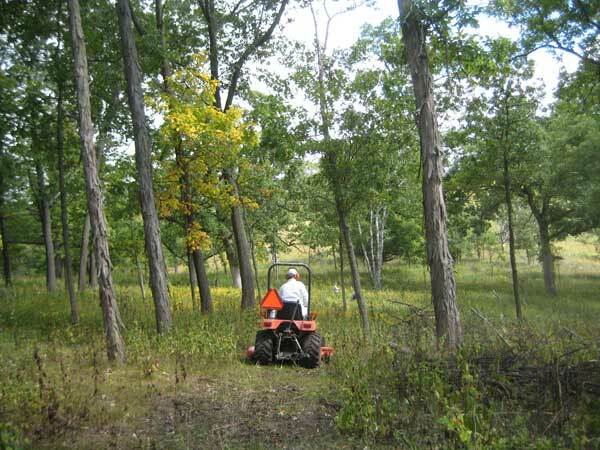 Both of these areas were once choked with buckthorn, which was removed about 10 years ago. Consistent herbicide use and annual burns have turned this area into a fine restored savanna. The new trail passes just uphill of an attractive grove of large open-grown bur oaks. Here is how we created this fire break. I walked the whole route starting from the Saddle road, marking the line with flagging tape. The next day, Amanda and Susan followed this line and cleared out all downed timber. This was mostly handwork, although a chain saw was needed for one large log. They also marked any tree stumps or rocks. Kathie followed behind with the Kubota mower and I followed Kathie with the Kawasaki Mule. The whole job took less than two hours. Mowing the new fire break. This new trail is already starting to serve its management purpose. A fairly large sumac clone and some small honeysuckles were discovered which had not been visible from previous trails. 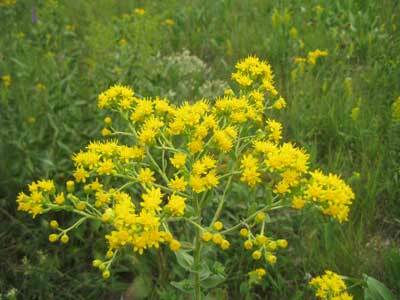 Showy goldenrod (Solidago speciosa) is in glorious color right now, and can be found in most of our planted prairies. It is also noteworthy because it is an attractive feature of the more open areas in our oak savannas, as the above photo shows. 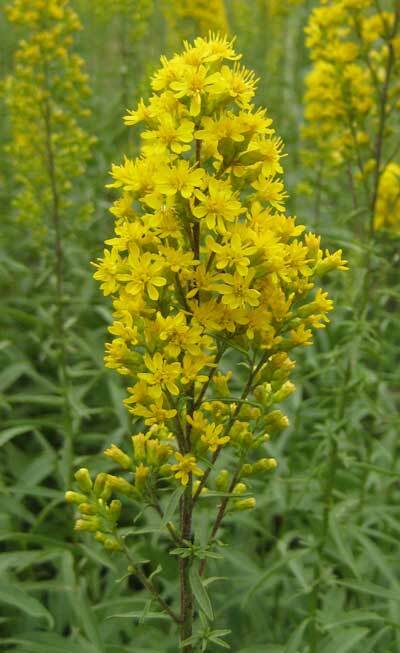 Like some of the other goldenrods, it grows in patches but it is not rhizomatous like Canada goldenrod and hence is "well behaved" in prairies and savannas. 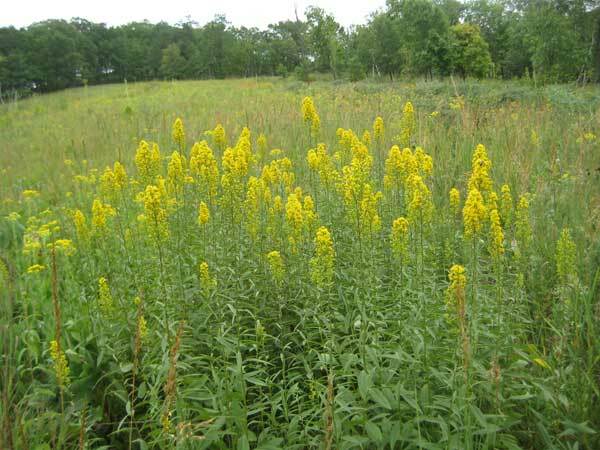 What is attractive about showy goldenrod is that its flower heads can be up to a foot long and are arranged in colorful panicles. The flower stalks don't curve downward like most other goldenrods, but stand straight up. This arrangement, together with the dense cluster of stems, is responsible for the attractive color. This species is native to Pleasant Valley Conservancy, and all of the seed for our plantings is local. When we started seed collecting work in 1997 there was one site, called "Toby's Annex", where this species was present. The seed collected there was planted nearby in Toby's Prairie, where it flourished, and provided seed for other plantings. The Curtis data (computerized by Umbanhowar and collated by Henderson) showed that this was a mesic prairie species, and since our oak savannas have extensive mesic areas, we used it in the seed mixes for all of the understory plantings. Over the years it has sorted itself out, and now we find it doing very well in the open savanna areas although not in the closed savannas. My rough estimate is that it prefers sites with a canopy cover of 30% or less. According to the botanical literature, this species is not very aggressive and hence should not get out of hand. Our experience at Pleasant Valley agrees with this idea. 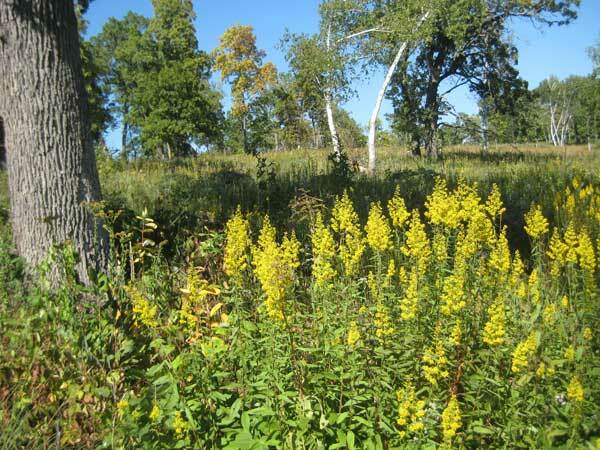 In fact, the original stand of showy goldenrod at Toby's Annex has almost disappeared over the past dozen years, although a few small patches still remain. Some plant species seem to be doing better in this drought year. 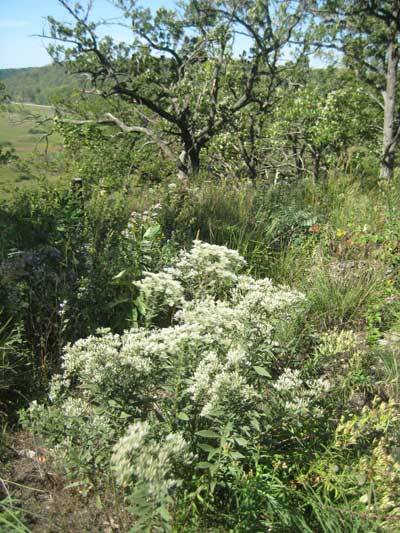 Among these is tall boneset (Eupatorium altissimum), which is now especially common in our savannas and prairies. Although not rare (it has a C value of only 4), it is found in Wisconsin only in the southern part of the state. Also, it is a calciphile, so in the Driftless Area it is found primarily in soil formed over dolomite. (Not surprisingly, the patch shown in the photo to the left was near an errant patch of buckthorn, another calciphile.) In some parts of its range, this species is called Joe Pye weed. However, in our area, the name Joe Pye refers to a wetland species, so there should be no confusion. 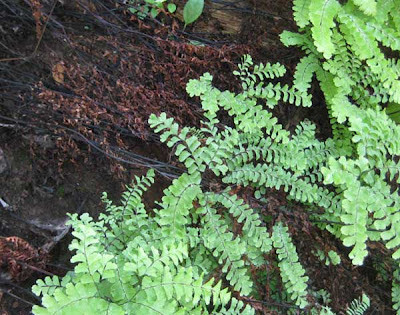 In a July post I noted that all of the ferns in one of our north-facing woods had died and were completely crisp from the drought. The ferns seemed more sensitive to the drought than any other groups of plants. I was happy to discover today that these ferns are now reviving and are showing lush new growth, brought about by the rains that have come since mid July. The photo shows the new maiden hair fern growth side-by-side with the crisp plants killed earlier in the summer. Other species of ferns in this woods have also recovered. Although there is still a lot of dead material, we can probably look forward to eventual recovery of this handsome woods understory. The graph, from the State Climatology web site, gives the history of our early summer drought. Note the long flat line in June! This graph also shows how deficient we still are for the year. Will we ever recover this loss? Despite the drought, we now have quite a few species of goldenrods in full flower, both in the prairies and savannas. Although not as deep rooted as the Silphiums, they seem to be doing quite well, provided the soil is reasonably fertile. The three species of goldenrods presented here are all flourishing in Toby's Prairie, a dry to dry-mesic site where the soil has developed on sandstone. The most common is stiff goldenrod (Solidago rigida). This species always does well in prairie seed mixes, and provides a lot of color at the end of the summer. This is a very common species, considered even a weed by Cochrane and Iltis, and may even be found along roadsides and other rights-of-way. It is found all over Wisconsin except for the northeast zone. Another fairly common goldenrod, although much more restricted in its distribution, is gray goldenrod (S. nemoralis), sometimes called Dyer's weed, old-field goldenrod, or nodding goldenrod. This is much shorter in stature than stiff goldenrod, and hence less conspicuous, but at PVC is often found on dry sites that the other two species don't colonize. We had a native population of this species on one of our tiny prairie remnants, and all of the seeds we have planted came from that local source. 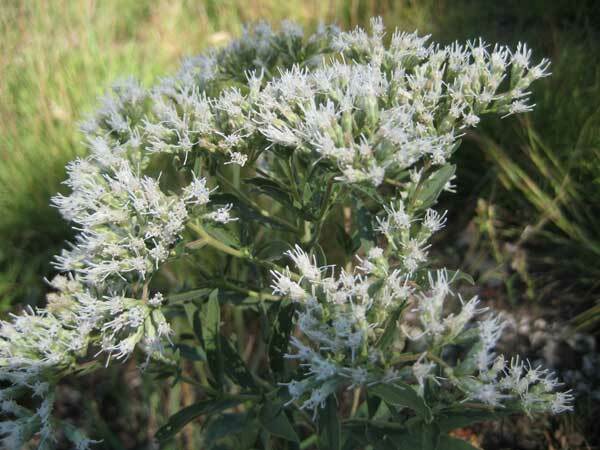 The third species of this genus now in bloom is showy goldenrod (S. speciosa), which is less common than S. rigida but very noticeable because it generally forms patches. There seem to be at least two separate subspecies of S. speciosa at Pleasant Valley Conservancy, one more common on the prairies, the other on savannas. We had a fairly extensive native population of this species in the remnant we call "Toby's Annex", and all of the seed we planted came from there. This was probably the prairie variety. The savanna variety (not shown here) may have got established on its own. It is smaller and has red stems. Showy goldenrod colony flourishing in Toby's Prairie. The most conspicuous goldenrod in bloom right now is one I am not inclined to discuss. This is Canada goldenrod, which is a rather annoying invasive (rhizomatous) weed which seems to thrive anywhere (old fields, prairies, savannas, wetlands, woods edges).